Juno-winning musician and northern advocate Susan Aglukark knows a thing or two about touring and the rigours of life on the road. Recently named the Interdis­ciplinary Centre for Culture and Creativity's Aboriginal Fellow in Creativity, Aglukark has travelled a long way from her home town of Arviat, Nunavut, to the U of S campus. As the Aboriginal fellow, she will mentor students in the Aboriginal Student Achievement Program, deliver a Fine Arts Research Lecture Series in Music and conduct a class titled "In the Company of Music" between January and April 2016. "I see the class as being about the journey of finding your creative self through music, learning how to use art as a tool to keep you focused on goals and dreams," Aglukark said during a recent phone conversation. "I hope the students learn that one-hit careers do not a wealthy person make." In the first month of the course, the celebrated musician will discuss "how I found myself accidentally in a career, how quickly the choice became using art as a healing tool." The second month will address her views on how the artist must become a business partner. "Especially as a solo artist," she said, "the band and crew, manager and agent, everyone gets paid; it becomes a necessary part of the equation." Part three will examine technology that has changed the music industry and how to integrate it into acareer. 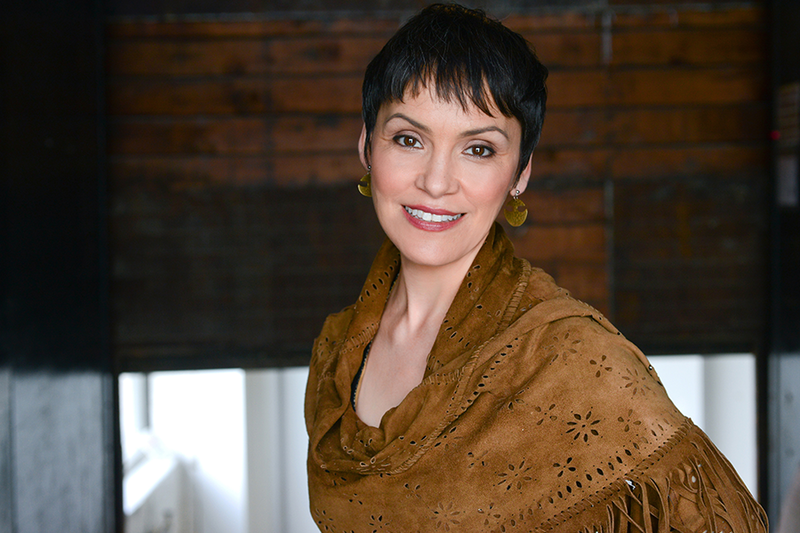 Aglukark has first-hand experience of the music industry's downsides. "Burnout," she said bluntly. "We forget to take care of ourselves as artists. Often we give up the art to take care of a paying gig. Then we wonder, where did the time for myself go?" The other culprit is music's business side. "I would say 60 to 70 per cent of musicians are bad at business. We find people who will take care of it for us and are loyal. I had to do it for a time, but that energy has to come from somewhere." Arviat is located on the north-western shores of Hudson Bay in Nunavut. Aglukark got her start singing in the choir of her Inuit preacher father's Pente­costal church congregation, and sang along at home with country, gospel, bluegrass and Christian music. After high school, Aglukark travelled south to Ottawa and took a job as a trans­lator with the former Department of Indian and Northern Affairs. Her music career's begin­nings were "very fast and sudden," she said, springboarding from two independent CDs to a music video which became a MuchMusic hit; she subsequently signed with a major label. In the ensuing years, collab­orations and acclaim, including two Junos, established Aglukark as a major Canadian music star. But music has not defined Aglukark's life. She has exercised her social conscience in many ways, most of which are addressed at improving northern life, and was made an officer of the Order of Canada in 2004. Seven CDs, thousands of miles, countless performances and 25 years later, Aglukark is as much honoured as a speaker and advocate for the people of Northern Canada as for her music. She is also once again an independent artist, looking for ways to raise money to get into the studio to record her next album. "The point is to make art: to paint, sew, bead—anything to make art to feed the soul," she said. "Even on the road, I squeeze in time to be creative." Ultimately, she added, "we hit a crossroads. Is it art or is it paying the bills? We forget very easily." dee Hobsbawn-Smith is a poet, essayist and fiction writer.